February | 2014 | What is ML Reading? As we age, time goes faster. But when you are seven-years-old waiting for a friend to arrive, time moves at a snail’s pace. In some ways it was easier before ML learned how to tell time. When I said, “10 minutes til bedtime, she didn’t know if it was two minutes instead of ten that lapsed. Learning to tell time is hard. When a child grasps the concept, it should be celebrated. Below are our favorite picture books we read when ML was learning to tell time. In this short month, my time for blog posts is limited. I’ve provided the publishers blurb. I promise the story and illustrations were kid approved. My brain’s just a little too fried this week to share ML’s thoughts on each book. What Time Is It, Mr. Crocodile? 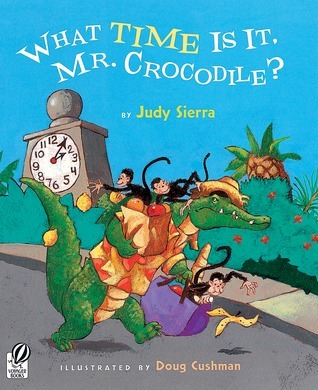 by Judy Sierra and illustrated by Doug Cushman -Mr. Crocodile has big plans for finally catching–and eating–five pesky monkeys, but those little rascals dupe him again and again. By the time the clock strikes six, those mischievous monkeys actually teach Mr. Crocodile a thing or two about friendship . . . and about having fun! 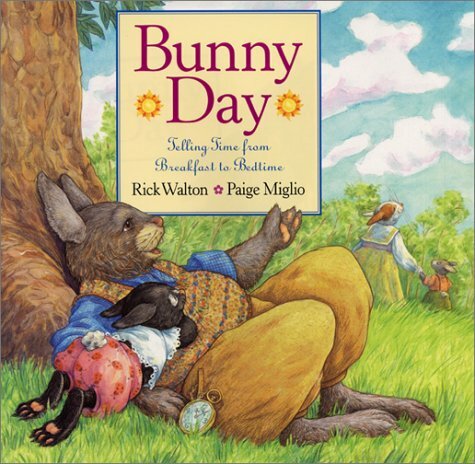 Bunny Day: Telling Time From Breakfast to Bedtime by Rick Walton and illustrated by Paige Miglio – Spend the day with a lovable bunny family from eight o’clock in the morning, when Father Rabbit wakes up his little bunnies, to eight o’clock at night, when Mother Rabbit tucks them into -bed. Every hour bunnies are busy doing something new: at eleven it’s chore time, at one they play, and at seven story time begins. What’s the Time, Mr. Wolf? 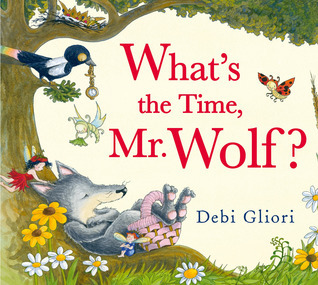 by Debi Gliori – Mr. Wolf’s day is packed, not only with his own activities and errands, but with such characters as three giggling pigs and a fiddling cat continually asking him what time it is, until, at last, it is bedtime. Several of these books show various types of clocks throughout the book. Some are easier to see than others. My favorite… showing ML the sundial in What’s the Time, Mr. Wolf? Lenore Look lives in New Jersey. Meilo So lives in the Shetland Isles, a subarctic archipelago of Scotland. If either visits Quail Ridge Books, we will be there. If someone wants to fund a visit to Scotland, ML and I will be happy to visit Meilo So on her small island. 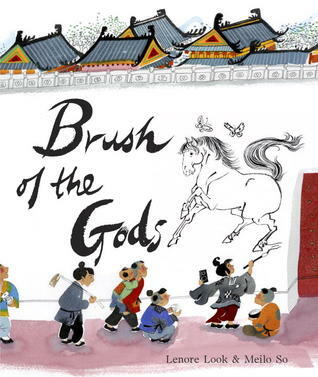 Brush of the Gods highlights the life of Wu Daozi; considered a master painter during the T’ang Dynasty in the seventh century. According to the author’s note, “He introduced the concept of depicting movement in figures and their clothing. His figures’ scarves billowed, their robes swung, and their hair blew in the wind.” Meilo So’s illustrations use watercolor, ink, gouache and colored pencils to represent Daozi’s style. 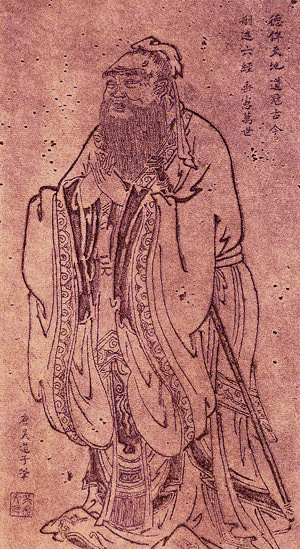 Legend has it Daozi entered an archway painted on the mural he created for the emperor and disappeared forever. None of his murals survived to present day. Below is an example of his work. 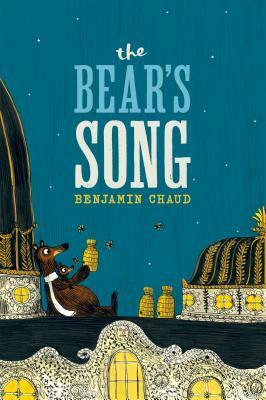 The Bear’s Song by Benjamin Chaud was first published in France in 2011 under the title Une chanson d’ours. It is exquisite and amusing. Papa Bear starts hibernating, but Little Bear is too busy chasing a honeybee “to hear winter’s whisper.” Papa suddenly awakens and realizes Little Bear is gone. From there, a cat and mouse chase begins through the forest, the city and into The Palais Garnier as Papa Bear searches diligently for Little Bear. The Palais Garnier is a 1,979 seat opera house in Paris. The story is simple, but the illustrations are not. The color scheme consisting mostly of muted red, gold, grey and black gives the book an elegant flair. ML searched for Papa Bear and Little Bear and Bee in each page spread. She enjoyed the detailed scenes… two woodcutters climbing a tree leaving the saw in the trunk below… an elephant in the window of a fancy apartment house… what ML perceived to be mermaid enjoying a drink with her date before the show. We loved the varied reactions of people encountering the bear. ML’s favorite scene… when the bear is on stage and everyone runs for safety. Especially those climbing the poles to get in the balcony. I always discover something when focusing on a book first published in another country. With this book, the cover of the English edition differs from the French version. See both covers above. It’s a marketing thing. 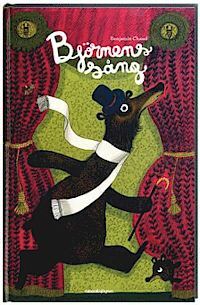 Lauren Smith created the cover, and her website states “My job was to create a new cover and interior text layout to work more effectively for the American market while still keeping its Parisian charm.” Maybe books with red covers sell better in France; and books with blue covers and cuddling bears sell better in the United States. Wishing I had the French version to see the differences in text layout. Check out the covers for other languages below. 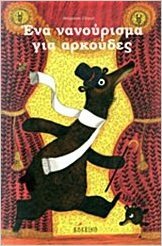 The Greek Version ena nanourisma gia arkoudes / ένα νανούρισμα για αρκούδες cover is the same image of the original French version but with a different color scheme and font. 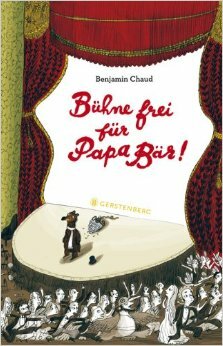 The cover of the German version Bühne frei für Papa Bär! differs completely from the English and French versions. 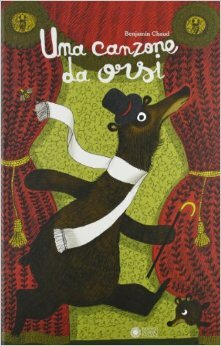 Other than the title,The Polish version Misiowa piosenka, Italian version Una canzone da orsi and Swedish version Björnens sång. Same illustration, same font, same color scheme. Thank you Chronicle Books for publishing this translation. ML and I will remember pouring over the illustrations many years. Check out the covers for other languages below. We found them fascinating. I wonder how many languages this book has been published in? 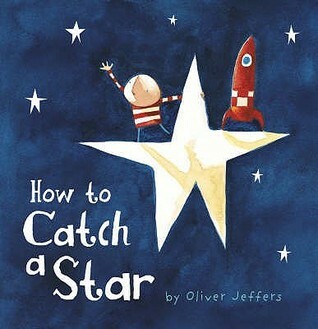 It deserves to be a star of children’s literature internationally. We are looking forward to the English publication of Coquillages et petit ours… The Bear’s Sea Escape in August, 2014. Amy Yu Gray created a new cover for the English edition. Last week, ML missed 4 days of school. One for sickness and the others as a result of Winter Storm Pax. Saturday, she started sneezing. I thought it was because our house was a little dusty. Sunday night it became apparent she was sick. She coughed the whole night. The next morning when I told her she couldn’t go to school, she cried. It was both the 100th day of school and Crazy Hat Day. The previous afternoon, ML carefully put together her attire… a big, red, old-lady hat and a pink and white polka dotted umbrella to use as a cane. She begged to go. I knew they would call me to pick her up as soon as I arrived at work. So we stayed home. Below are two books to enjoy when you’re sick. One to make you laugh. One to make you feel warm and loved. In Chu’s Day by Neil Gaiman and illustrated by Adam Rex, his parents are always asking, “Are you going to sneeze?” There’s a good reason. Chu has a very big sneeze. Sorry, no more details. I don’t want to spoil the fun. The pacing and illustrations make it a perfect read-aloud. Starting next book club, I’ll read a picture book at the beginning. Chu’s Day is first on the list. 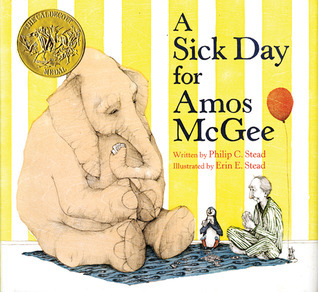 A Sick Day for Amos McGee written by Philip Stead and illustrated by Erin Stead received the 2011 Caldecott Medal. The illustrations using woodblock printing and pencil are subtle, yet rich. Visual elements not discussed in the story add extra enjoyment. Look for the bird, mouse, teddy bear and red balloon. Each a story within the story. It is one of the sweetest stories, we’ve read. Not saccharine… a story of genuine love and respect for each other. Amos is a zookeeper. 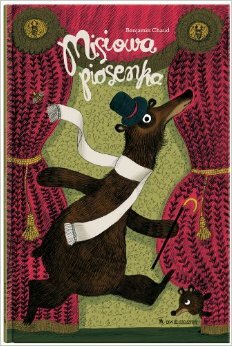 He’s dependable and a good friend to all the animals in the zoo… playing chess with elephant, running races with tortoise , sitting quietly with penguin, lending a handkerchief to rhinoceros, reading stories to owl. He knows the needs of each animal. One day, Amos isn’t at work. The animals wait for the number 5 bus. Upon arriving at Amos’ home, they find he is in bed sniffling and sneezing. Each animal takes care of Amos in their own special way. Knowing this book’s created by a husband and wife team adds to it’s loveliness. 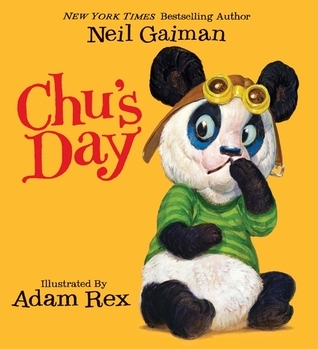 Coming June 2014, another Chu book – Chu’s First Day of School by Neil Gaiman and illustrated by Adam Rex. I hope the Steads are in the process of collaborating on another book. Recently, the Opening Ceremony for the Olympics in Sochi was viewed by millions. Throughout the next few weeks, hundreds of athletes will win medals. In my eyes, ML received a medal more important than an Olympic Gold. Why did ML earn this medal? For being respectful, helping others, and being excited about learning. I akin it to her school’s version of a Nobel Peace Prize. I know, a little over-the-top. Even without the medal, I know ML is excited about learning and does her best to help others. Her teachers from preschool to first grade say this every year. She doesn’t need a medal for me to be proud. At the same time, it’s nice to have it recognized in a special way. Sadly, her medal wasn’t with her. She took it off and put it with her jacket to play in the gym. She thinks it was stolen because one child whose name wasn’t called in the assembly was wearing one. It was late and she was almost asleep so I didn’t talk this potential theft through with her. 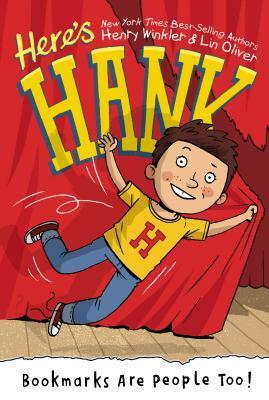 If it comes up again, we’ll talk about the book we read recently, Nancy Clancy, Super Sleuth by Jane O’Connor and illustrated by Robin Preiss Glasser. A marble is stolen from a school exhibit. Everyone is blaming each other. The real thief feels very bad about what she did, but doesn’t know what to do to rectify it. Then, I’ll remind her about the time she stole something when she was in preschool. It will help put her disappointment in perspective. 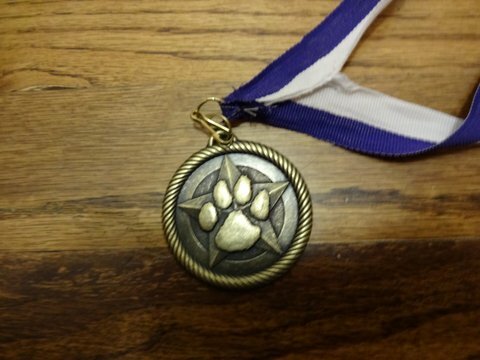 The school’s giving ML a replacement medal. Happy Valentine’s Day – Mommy, You’re My Woolly Mammoth! 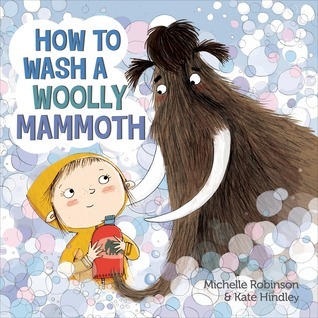 You won’t think your child saying, “Mommy, you’re my woolly mammoth” is a compliment, until you read How to Wash a Woolly Mammoth by Michelle Robinson and illustrated by Kate Hindley. We laughed through this 10 Step instructional book. I appreciated the clever use of an umbrella in Step 6. ML guffawed at Step 8. It involved a trampoline and mud. We really howled at the hairstyles in Fig. 1 – Fig. 8; reaching a unanimous decision. “Bubble Bliss” is the most attractive hairstyle for a woolly mammoth. The illustration on the last page spread explains why I consider, “Mommy, you’re my woolly mammoth” a compliment. It’s snuggly. Yes, I know snuggly isn’t a word. It should be. Happy Valentine’s Day from ML and her woolly mammoth. Yesterday in Raleigh, the ice and snow came earlier, faster and more furiously than forecasted. Thankfully, schools were cancelled so it didn’t turn into an Atlanta. We had one of those a few years ago. I work Wednesday nights so I arrived at 12:15. A single snowflake grazed my cheek as I entered the library. Upon arrival, my coworker showed me the radar and how fast the storm was moving. She encouraged me to get back on the road. My twenty minute commute turned into a one and a half hour commute. No complaints here. It helped knowing ML was safe and sound at her Dad’s house. I feel fortunate. My only challenge; getting my seventeen-year-old Honda up the last little hill before home. Two college girls knocked on my window, offered to push me up the hill and told me to gun it. Friends and coworkers commutes were more treacherous. One friend was involved in a four car accident. Thankfully, no one was hurt. Not too slight Lin Oliver. We looked forward to meeting her too. It’s just she wasn’t my first crush. They are a dynamic team. Watch this video to learn how they write together. Lin sits at the computer because she types. Henry Winkler doesn’t. The illustrator Scott Garrett deserves a shout out too. ML loved every one of his illustrations. He has a funny post about thinking when Henry Winkler calls him out of the blue to talk about the illustrations, it’s a prank. Check out the webpage about the dyslexie font. I hope we see this font selected for more children’s books. It would be a shame for publishers to not take advantage of a font that helps children read easier. 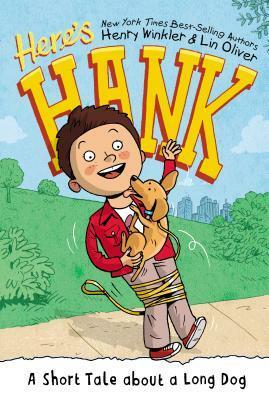 Thank you Henry Winkler for introducing this font to me and others. If reading were a challenge for ML, I would purchase this font and type short stories for us to read together everyday. Until this year, ML made her Valentines for school. Recently, she asked, “Mommy, do I have to make valentines this year? Can we buy them?” As an afterthought, “I want to give the ones with candy attached.” So we purchased valentines with candy. Actually, the only types available included candy. ML will drop Scooby Doo and Hello Kitty valentines with lollipops into her classmates homemade valentine boxes. This weeks homework assignment – decorate a cereal box for Friday. At least something will be handmade. Not only is ML over handmade valentines. She’s done with the sappy hug, kiss my baby, love my mommy books. Quite honestly, I am too. Below are some non-gushy, non-mushy, non-drippy books about love to read this week. 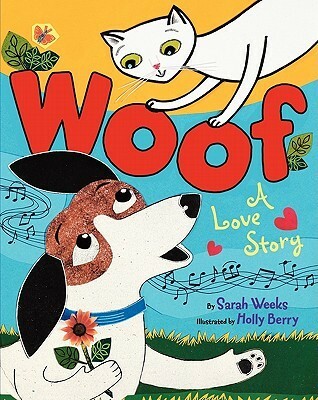 Woof: A Love Story by Sarah Weeks and illustrated by Holly Berry– Dog is in love with cat. But they don’t speak the same language. With the help of a musical instrument he digs up, dog is able to declare his love so cat understands. The play on words of the instrument is a humdinger. Can you guess what it is? 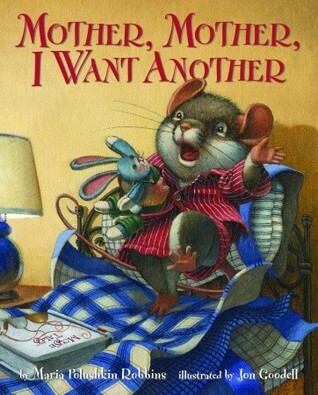 Mother, Mother, I Want Another by Maria Polushkin Robbins and illustrated by Jon Goodell – We love this story about Mrs. Mouse and her child. Mrs. Mouse does not let her little mouse finish a sentence before she takes action; resulting in an amusing misunderstanding. 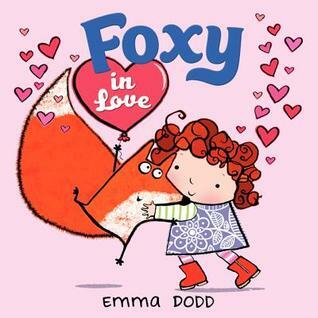 Foxy in Love by Emma Dodd – Foxy helps his friend Emily understand the true meaning of Valentine’s Day. It’s not about what you love. It’s about who you love. We also purchased and downloaded adorable dog valentines created by ARIllustration. ML colored and embellished them with crayons and glitter glue this weekend. Friday, my friend told me I must be crazy to take a bunch of girls to Marbles on a Saturday. She misunderstood; thinking I was supervising sixteen girls by myself. I explained parents and a teen were helping out. She’s seen me at my craziest so she was relieved to hear I hadn’t lost my mind. At 12:30, our teen helper, ML and two other girls who rode with us arrived for the official Book Club Field Trip at Marbles Kids Museum. While Lillian watched the girls, I stood on the street waiting for parents to drop their daughters. How did our parents coordinate all these things without cell phones and texting? My reason for the field trip… I wanted the girls to meet a real live illustrator. 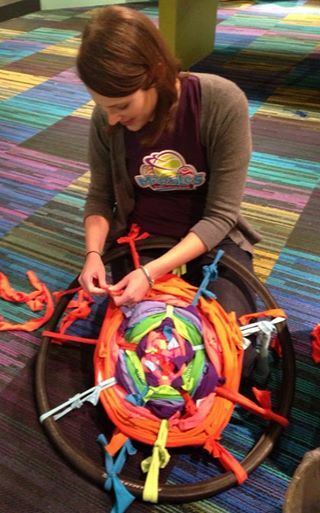 Amy Richards, author and illustrator of the ABC’s of North Carolina is Artist in Residence for February. Some of the girls met her. A mob of preschool and elementary-school children surrounded her. So we didn’t have a chance to have a conversation as a group with her. I’ll try to set up a future book club where Amy can join us. It was a zoo. Each adult was assigned three children. So it was less a book club meeting; more a book club play date. No book discussion or book related activity. Next month includes a discussion of Nancy Clancy Super Sleuth, a mystery activity and poetry. No Marbles. Today put things in perspective. Sixteen girls running around our house and yard is no big deal. Especially since the backyard is in the process of being fenced. Next book club…sometime after the fence is finished. I lied, there will be marbles at the meeting. 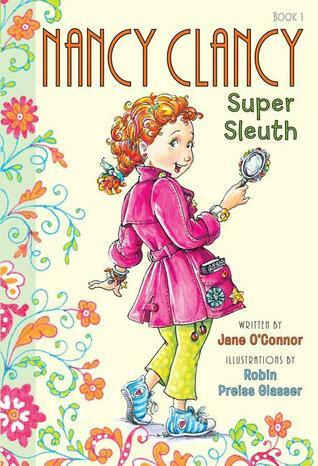 Marbles play a key part in the mystery solved in Nancy Clancy Super Sleuth. Toy marbles and 16 girls I can easily handle with the help of a teen or two. Marbles Kids Museum even with a ratio of one adult to every three kids is exhausting. An added bonus – we met UNC-TV’s Read-a-roo, Super Why, Princesss Presto and Betsy Kindergarten. Afterwards, we learned about PBS Kids 2014 Writing Contest. ML and friend discussed their story ideas on the way home. Sounds like they are Rainbow Magic ghostwriters. You can learn more about the contest at UNC-TV. Please do not be discouraged from visiting Marble’s Kid Museum. It’s an amazing place. A hint I learned from the staff… Saturday mornings are calmer. Recently, ML had an early release day from school. I arranged my schedule so I could pick up ML and her friend. We took advantage of the nice day and joined friends at the park. We call this park “Triangle Park” because of it’s shape. One side of the triangle contains a creek. It was 6 boys and ML playing at the creek. All of sudden ML ran up the bank and said, “Mom, they are rolling in the mud like a bunch of rhinoceroses.” And 4 of the boys were. Surprisingly, ML and her friend I picked up from school were not. On the way to the park, I promised to take them to Sugarland, a local bakery with divine cupcakes. They were smart enough to know, Sugarland doesn’t allow mud coated children in the door… And I don’t allow sopping wet, muddy children in my car. Even though my car is disgusting. I try to keep it clean. With a seven-year-old, it’s not my top priority. But even I draw the line at wet mud. Thankfully, the “rhinos” we left at the park were close enough to their houses to walk home. In honor of her rhino friends, we read a nonfiction and fiction rhino book. 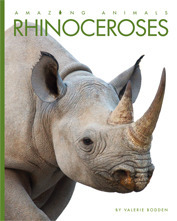 Rhinoceroses by Valerie Bodden – An easy to read nonfiction book with large colorful illustrations. A fascinating fact we learned… Rhinos can run 28 miles per hour. But they don’t run far.” If people weighed up to 7,000 pounds they probably wouldn’t run far either. A bonus at the end of the book is a folktale about why rhinos have bumpy skin. 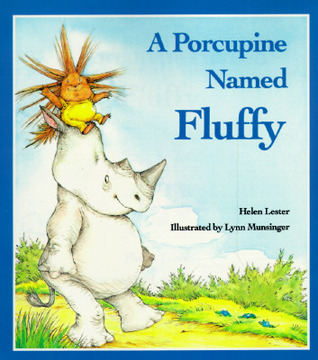 A Porcupine Named Fluffy by Helen Lester and illustrated by Lynn Munsinger – Are you confused? Yes, it’s a book about a porcupine named Fluffy. What were his parents thinking? Throughout his life, he learns he is not fluffy. Then, tries to become fluffy by attempting to be a cloud, soaking in a bubble bath, covering himself in whipped cream, eating marshmallows and more. Only when he meets a rhino named Hippo does he accept his name. From then on, they share a friendship filled with laughter. Learning to laugh at yourself is something I hope to instill in ML. As for the cupcakes, ML and friend ordered the Cookie’s and Cream. The server talked me into Elvis – Banana Cake with a Peanut Butter mousse filling and cream cheese icing, with a caramel drizzle and bacon on top. He promised me if I didn’t like it, I could choose something else for free. It was amazing! I’m surprised at the number of different flavored cupcakes, I’ve tried from there. Haven’t been disappointed yet. 2014 Notable Books – How Did the Committee Do? The results are in for the 2014 Notable Children’s Books chosen by the Association For Library Service to Children. 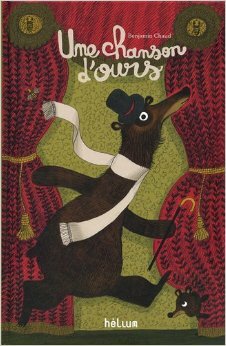 ML and my choices can be viewed at Notable Children’s Books: ML’s Favorites and Mine. When I compared ML and my picks with the winners, I was both excited and disappointed. I admit, we haven’t read all the books which made the list for Younger Readers. I requested the titles our library owns. In a future post, I’ll share ML’s opinion on the books we haven’t read. In the meantime, the book we are most disappointed not on the list, Little Red Writing by Joan Holub and illustrated by Melissa Sweet. 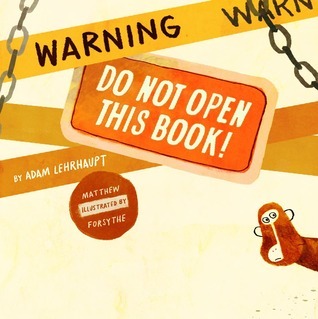 On a positive note, we are thrilled Warning: Do Not Open This Book by Adam Lehrhaupt and illustrated by Matthew Forsythe made the list. A sequel will be available Fall 2014 – Please: Open This Book. Three cheers for more monkey mayhem. Last night we read two books about doctors in preparation for ML’s seven-year-old check-up today. On the way she said, “I’m going tell the doctor I am allergic to shots.” To ML’s delight it was a shot free visit. ML’s next comment left me cringing. “I’m fat” she said. Concerned I asked, “Why do you think that?” ML’s response, “Because the backs of my legs jiggle.” ML’s expressed this a few times these past few weeks. Her doctor did a fantastic job assuring ML she shouldn’t be concerned about her weight. The doctor kicked out her leg to show the jiggle at the back of her own legs, and explained how muscles contract and relax. 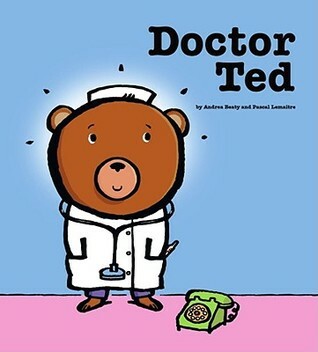 Doctor Ted by Andrea Beaty and illustrated by Pascal Lemaitre – Doctor Ted is imaginative; but his diagnosis and treatment plans leave many of his patients angry. It’s best not to tell the principal he has bad breath and a shot in the mouth is needed. Eventually, the principal reconsiders Ted’s doctoring abilities. A teacher falls on the playground. The principal is too busy yelling “HELP… call an ambulance! Call the fire department. Call the library.” Meanwhile, Doctor Ted is saving the day. ML chuckled at the illustrations throughout the book. She howled at the one of the librarians arriving at the scene of the accident with books balanced on their heads. Doctor Ted ends with Ted smelling burnt toast. He decides to leave the medical profession for another occupation. Can you guess? ML did. She exclaimed, “I read Firefighter Ted.” I asked, “Do you want me to bring it home?” I received a resounding, “Yes.” To complete her Ted adventures, I’ll bring home Ted’s other book, Artist Ted. 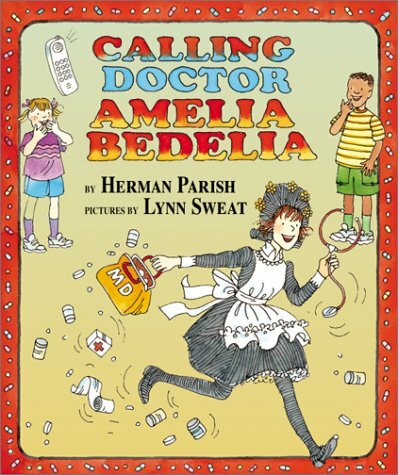 Calling Doctor Amelia Bedelia by Herman Parish and illustrated by Lynn Sweat – During first grade, I was Amelia Bedelia’s number one fan and hoped ML would follow the family tradition. She didn’t until last night. I tried Amelia Bedelia books on her in kindergarten, but the text requires an understanding of language and idioms to appreciate the humor. Last night, most of the wordplay made sense to ML. I explained some of the ones she didn’t understand. The others she can discover at her own pace. My all-time favorite Amelia Bedelia scene is when she “dresses the chicken.” ML enjoyed Amelia Bedelia allowing the boy to “draw” his on blood using a red pen and the paper on the examination table. Luckily no blood was drawn today. The one time ML remembers blood being drawn traumatized her. The nurse returned to the room with “the sticker.” Without warning, she went straight to ML’s finger and gave it a prick. ML cried more from being startled than in pain. She’ll probably ask for Amelia Bedelia’s way the next time she needs blood drawn. Amelia Bedelia’s provided laughter to families for fifty years. Amelia Bedelia books were written by Peggy Parish until her death in 1988. Her nephew, Herman decided to continue the series almost 10 years after her death. Amelia Bedelia adventures are now in picture books, easy reader books and chapter books. Now for a chance to share a story time rhyme which can help kids get ready for a doctor visit. Awhile back, I discovered one perfect for getting the wiggles out. I wanted to use the rhyme but had a dilemma. It asked the children to “touch your tongue.” I stamp hands at the end of story time. The last thing I want to do… touch hands which touched tongues 10 minutes earlier. So I modified it to “stick out your tongue.” Then, realized I wasn’t modeling p0lite behavior. So I modified it again asking the preschoolers to stick out their tongue and say ahhhhhh. It’s a hit! Especially when I ask, “Can you be loud?” Then, we scream it at the top of our lungs. We usually start in a normal voice. Then, really loud. Finally, a whisper to calm before the next story. It’s a rhyme that works with preschoolers and elementary-aged children. Try it out…. Maybe I should teach it to doctors for those children who refuse to say ahhhh. Oliver Twist can you do this? Number 1 stick out your tongue. Number 2 touch your shoe. Number 3 touch your knee. Number 4 touch the floor. Number 5 jump up high. 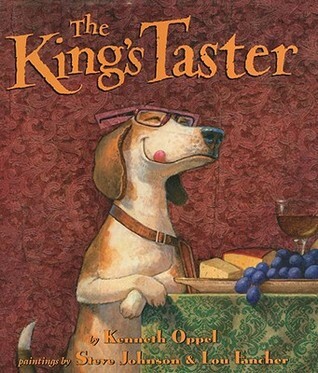 The King’s Taster by Kenneth Oppel and illustrated by Steve Johnson and Lou Fancher – The new king is a picky eater and bratty boy. His taster who makes sure the food is not poisoned is Max… a dog who knows his master is the “best cook in the kingdom.” The king does not agree. He won’t try anything… wild boar, venison, cheese pies, french fries, pizza, or tacos. The king decides it’s time to get rid of the cook by chopping of his head. Max saves his masters life when he discovers the reason the king will not eat anything cooked by the royal chef. The little brat is spoiling his dinner by sneaking all sorts of treats. How does the chef handle the situation? He threatens to tell the king’s mom. Kenneth Oppel writes picture books and chapter books for children, plus young adult novels. His book Airborne is a 2005 Michael L. Prinz Honor Book. (That’s a big deal!) I look forward to exploring his longer works for book ideas when ML is a teenager. According to their website, Steve Johnson and Lou Fancher “have worked as a creative team for over 26 years… together they have illustrated over 45 children’s books, including Dr. Seuss’s My Many Colored Days and Jon Scieszka’s The Frog Prince, Continued.” More of this imaginative teams books will be featured on this blog. A little heads up… look at my post on Baseball’s Opening Day. Normally, I don’t find it difficult putting down a chapter book for kids. However, Ophelia and The Marvelous Boy by Karen Foxlee and illustrated by Yoko Tanaka hooked me from the beginning. Thursday night I stayed up late wanting to finish the book. At 12:30 my eyes couldn’t stay open a minute longer. When I awakened, I went straight to the book. Ophelia is an asthmatic, pip-squeak. This is her story… “In which young Ophelia rescues a magical boy, battles the Snow Queen, and saves the world. ” From the beginning, we know the heroine prevails. Even so the story is exciting and fear inducing. Watching this practical, scientific minded girl move beyond her comfort zone and embrace the magical realm is heart-warming. It’s a sorrowful book filled with hope. Ophelia is a matter of fact kind of girl. I love her straightforwardness. She thinks, “The best way to get to the bottom of things was with questions.” Then asks, “And how can someone take your name from you? I don’t think it’s really possible.” You’ll understand these quotes when you read the book. And you must read this book! Ophelia is grieving the recent death of her highly creative mother and her father’s inability to outwardly show grief. Her father is the premier international expert on swords invited to curate an enormous display of swords at a museum in an unnamed frigid city. With only three days until Wintertide and the unveiling of The Sword Exhibition, he is engrossed in his work. Leaving his daughters to their own devices. Ophelia’s mother embraced the world of things not seen. Listening in her heart to her mother’s creative spirit and using her own practical, scientific mind; Ophelia saves the world. In the process, she saves her family… her stoic father and her sister who copes with her mother’s death by embracing a shallow world. Yoko Tanaka’s book jacket and interior illustrations are magical. You can’t judge a book by the cover, but it’s the cover that led me to opening this book. Study the illustrations on the book ends before you read the book. This book is best enjoyed if you know the layout of the enchanted museum. When you finish, pour over the illustrations again. You’ll appreciate the physical strain on Ophelia in her fight of good vs evil. 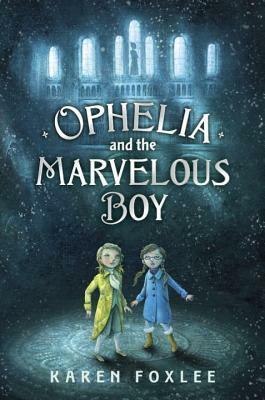 Ophelia and The Marvelous Boy is now included on the book list for ML’s Book Club’s 4th grade year.